The objective of passing is to move the ball quickly among teammates in order to keep it away from opponents and, ultimately, in order to put the ball into a position for a shot on goal. The “inside of the foot” or “push” pass represents the most basic pass in soccer. The youngest players are usually introduced to the inside of the foot pass first because it is the easiest to learn, it is effective over short distances, and it does not require much leg strength. Although it is a little awkward at first for young beginners, the push pass provides the highest level of control because the shape of the inside of the foot conforms to the shape of the ball. Once the inside of the foot pass has been mastered, coaches may progress to passing involving player movement and then to the “instep drive” kick, which allows for passing at greater distances. The push pass, however, still represents more than half the passes used in games, even at the highest levels. An analogy for the inside of the foot pass can be made with the use of a putter in golf. The head of the putter is pointed to the outside so that the surface of the putter can strike the ball perpendicular to the intended path of the ball. The putter is locked in place by the wrists so that the head does not turn. The putter is brought back to obtain force, it is freely swung, and a follow-through is used. The putter is not allowed to contact the ground as the ball is struck. An actual putter may be used in a demonstration, utilizing a golf ball, a tennis ball or a small soccer ball. Demonstration of the ultimate result: Announce that the name of the skill is the “Inside of the Foot Pass” also known as the “Push Pass.” Show a proper kick of a ball to partners, in slow motion, from three directions, front, side and back, as seen by the observers. It should then be clearly shown that the ankle is locked and not being allowed to flop around. Show the ankle flopping and explain that this is “what not to do.” It should further be shown that proper balance will allow the kicking foot to swing freely “through the ball” by kicking the ball, following-through, and not putting the kicking foot back on the ground immediately. Demonstrate the golf putter analogy, if desired. The ball is to be kicked in a nice straight line along the ground. Foot to the outside and ankle locked position: Show the foot pointed outward, with slight flexion (“toes toward the shin”) and the ankle locked, from the front, side, and back. Clearly demonstrate swinging the leg in the kicking motion that the ankle stays locked during the entire swing. Demonstrate what not to do by not locking the ankle and flopping the foot around. Ask that the players hold one foot off of the ground, extend the foot and lock the ankle. Placement of the non-kicking foot: The last step before attempting a true inside of the foot pass is to demonstrate and practice the proper placement of the “plant” or non-kicking foot. To eventually contact the ball, the non-kicking foot is placed “level” or “even” to the side (not touching) the ball, but far enough away from the ball to allow for the outside extension of the kicking leg and foot. This should be demonstrated by the coach, using a ball, while facing away from the players. The non-kicking foot should point directly ahead and the extended kicking foot should be placed out to the side and held directly behind the ball. This placement of the plant foot allows the ball to be kicked along the ground. Inside of the foot contacting the ball: Add the ball, held by the parent, so that it can be struck with the inside of the foot, first with one foot and then switching to the other. 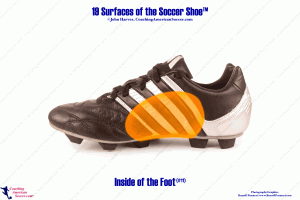 Parents need to observe and ensure that the player is properly striking the ball with the inside of the foot at the “center,” “middle,” or “fattest part” of the ball. Standing inside of the foot pass, right then left, using proper form and not for power or distance. Same as above with a simple walk up to the ball and kick. Run up to the ball and kick. As with the instruction of all skills, the coach should move among the players and gently offer corrections at each stage. Some young players may “stab” at the ball and then transfer their weight to land on their kicking foot. This can be demonstrated as “what not to do.” Similarly, if the plant foot is placed forward of the ball, the kick will tend to push the ball into the ground. If the plant foot is placed behind the ball, the kick will tend to loft the ball. Proper placement of the plant foot beside the ball will be rewarded with a kick that sends the ball running along the ground. Extremely important note: To achieve success in teaching the inside of the foot pass, the size of the ball is critical to the age group involved. Little feet require a small soccer ball. Nothing larger than a “Size 3” is recommended for young beginners, pre-kindergarten to approximately six years of age.